We’ve all witnessed tow truck drivers racing to be first on the scene after a vehicle accident. 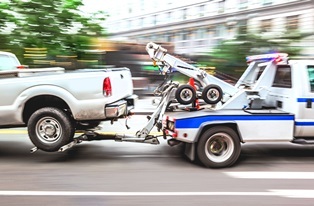 Tow trucks can help clear accident scenes quickly, but negligence on the part of the truck operator or towing company can lead to complicated injuries. Aggressive driving. The first driver to arrive when a vehicle must be towed typically gets the job. Drivers therefore have a powerful incentive to get to the scene fast, even if that means speeding, making sudden lane changes, or ignoring traffic signals. Drowsy driving. Many tow truck operators work long shifts and odd hours. Unlike big rig truckers, they're not required to take regular shift breaks. This can lead to extreme fatigue, clouding the driver’s judgement and slowing reaction times. Defective or poorly-maintained vehicles. Towing companies have a responsibility to routinely inspect and maintain their vehicles. Defects or a lack of maintenance may increase the risk of brake failure and tire blowouts, which are among the most common causes of tow truck accidents. Improperly-secured vehicles. Problems with hooks and cables might detach a tow vehicle or force it to roll off the truck bed. If this occurs when the tow truck is moving, other vehicles may be struck by the towed car, or collide when drivers behind swerve to get out of the way. If you were injured in a tow truck accident, you may have a claim against the tow truck driver and the towing company. If your collision was caused by a defective tow truck part, its manufacturer may also be held liable. You may be entitled to compensation for your medical expenses, lost income, and pain and suffering. To learn more, contact the law offices of Steve M. Lee, P.C., by using the form on this page.